UP Yoddha and Gujarat Fortune Giants played out a thrilling 30-30 tie in Inter Zone Challenge Week on Friday. It was a game which either team could've won but couldn't capitalise at crucial moments. Nitin Tomar scored seven points for UP Yoddha whereas Sukesh Hegde scored five points for Gujarat Fortune Giants. Both teams started on equal footing as it was 2-2 after four minutes. Surender Singh made a successful raid in the fifth minute as UP Yoddha led 4-2. Rishank Devadiga scored three points as UP Yoddha led 7-3 after eight minutes.UP Yoddha inflicted an all out in the 11th minute to lead 13-5. Gujarat Fortune Giants scored two points in a minute to trail 7-13. Another two points were scored by Gujarat defence as they trailed 9-13 after 14 minutes. Nitin Tomar made a successful raid in the 15th minute as UP Yoddha led 17-9. Gujarat Fortune Giants made a comeback in the last minutes of the first half as they inflicted an all out to trail 16-18 at the end of the first half. UP Yoddha held a slender advantage at the beginning of the second half and extended it further as they led 22-16 after 24 minutes. 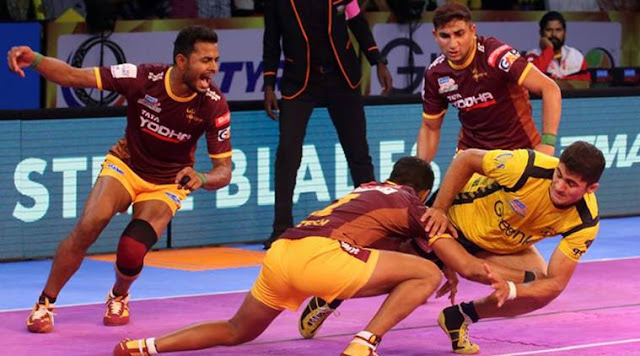 Gujarat scored four points in the next five minutes as they trailed 21-22. Gujarat led 25-22 after 30 minutes as they inflicted an all out. Rishank Devadiga and Nitin Tomar shared the raiding load for UP Yoddha as they combined to score 11 points. Gujarat Fortune Giants led 28-25 after 35 minutes as UP Yoddha struggled to claw their way back into the match. Nitin Tomar scored with a two-point raid in the 36th minute as they trailed 27-28. UP Yoddha took 29-28 lead in the 37th minute to turn the match on its head. The pendulum swung in Gujarat's favour in the 40th minute as they led 30-29. UP defence scored a tackle point in the dying seconds to tie the match at 30-30.